Stunning design with a notched screen and thin bezels. Extraordinary battery performance with long life. Low price for the provided features and quality. Screen resolution could have been better. Charging seems to be slow. 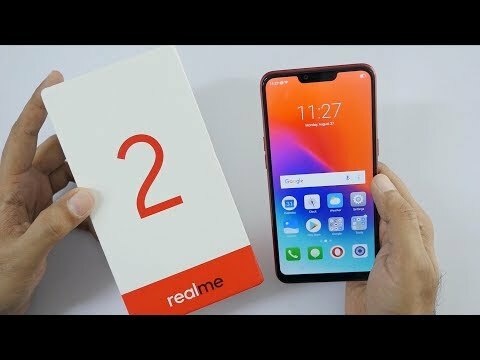 If you own Realme 2 64GB, please do leave your feedback too. Lowest price of Realme 2 64GB price in India starts at Rs. 10,990 Realme 2 64GB is available on Flipkart at Rs. 10,990 and on Amazon at Rs. 12,799. Prices updated on 21st April 2019. The phone sports a diamond-like geometric pattern on a fibreglass body that reflects light in different ways. The notched screen is 6.2 inches in size, delivers a resolution of 720x1520 pixels, and is protected by Corning Gorilla Glass 3. It is also available in three trendy colours - Diamond Black, Diamond Red, and Diamond Blue. The Realme 2 also hosts a dual rear camera with a combination of 13MP + 2MP, with the latter used for depth detection. The selfie camera stands at 8MP and offers HDR. The Realme 2 is perfectly capable of handling all day-to-day tasks but slightly struggles with resource-intensive tasks. An internal memory of 64GB and a RAM of 4GB has been provided along with the Qualcomm Snapdragon 450 chipset. The battery has been given a boost of 25% compared to the Realme 1 with a 4230 mAh capacity. Additionally, usual connectivity options have been provided including Wifi, Bluetooth 4.2, GPS, micro USB 2.0, and 4G. The Realme 2 runs Android 8.1 Oreo with Color OS 5.1 on top. Additionally, the installed sensors include Fingerprint (rear-mounted), Accelerometer, Proximity, and Compass.